NYCI developed a poster naming a number of issues that young people face on a daily basis in Ireland. It asks if young people in communities throughout Ireland are experiencing some of these issues. It invites youth leaders to discuss this with their groups and to come to this website to learn more. Please scroll down to the issue that interests you to learn more about it. Each of the issues is explained further and the resources you can use to explore the topic are suggested. The issues arose during a national consultation with young people on June 28th that NYCI hosted. The topic of the consultation was integration and inclusion in Ireland. The event brought together 70 young people and youth workers to identify the issues. The young people explained how the issues were affecting them and they discussed ways to make things better. Their recommendations focussed on the changes needed at EU and national level. Their recommendations were sent to the EU Youth Conference in Cyprus. The discussions were part of the EU wide Structured Dialogue process that encourages youth participation and involvement in policy decisions that affect them. (Scroll down to the end of this page to learn more about Structured Dialogue). During the discussion the young people also suggested solutions that could be applied at a community level through youth groups. These are presented here under their relevant issue. You may like to use them to start discussions on developing solutions for your own community. While the discussions on the day focussed on migrant young people in particular, it also included other minority groups. The people who attended the consultation came from a broad range of backgrounds many of whom were not migrants. Explanation: This was considered to be the most important issue overall. Young people spoke about what it is like to be ‘different’ in Ireland. They often feel that people in Ireland focus on their difference and make them feel like they don’t really belong. Or they gloss over their differences and expect them to be the same when they don’t feel they can be. They need instead to feel that their differences are accepted and valued – that diversity, and finding ways to include everyone’s needs, is the norm. Sometimes people feel excluded because they cannot afford to take part in some activities or that they don’t know the routes to becoming involved. Opportunities aren’t presented to them and they don’t know where to go to find out about things. There are a lot of informal networks that connect Irish people together that some young people aren’t part of and aren’t invited into. These experiences were described by migrant young people, LGBT young people, people who left school early and people with a disability. Some young people experience discrimination and other forms of exclusion daily. Travellers, amongst others, often describe such experiences and how they led to exclusion and isolation. Explanation: Racism is an ever present and growing reality for many people from minority ethnic backgrounds, including Travellers. Very few have escaped it and for some it has resulted in serious injury. Another aspect of racism is the fear that prevails that a racist incident may occur. This fear can prevent young people or their parents being comfortable about them attending after school activities. For the LGBT community the fear around homophobic bullying can be equally intense and pervasive. Explanation: A significant number of young people from migrant backgrounds (100’s each year) who are long term resident in Ireland and have completed all or most of their 2nd level education in Ireland are asked to pay up to 3 times what their peers pay to attend 3rd level education (international fees). And they are not entitled to apply for education grants. This results in severe hardship for the families or more often they have to refuse access to 3rd level education to their children because they cannot pay the costs involved. The cause of this issue is the visa regulation that says that on reaching 16 a young person must apply for a visa in their own right. With such a short window of time it is not possible for them to qualify for citizenship before they are due to enter 3rd level. Many career guidance counsellors are unaware of this and often the families do not know about it until it happens. Many families living in Ireland have not become Irish citizens. There is also a group of Irish born children who are denied equal access to 3rd level education. These are children who have status based on the IBC (Irish Born Child) scheme. In 2005 foreign national parents, whose children were born in Ireland prior to January 2005, were granted long term residency. There is a clause in the scheme that gives the children a right to education on the basis of all other Irish children up until but not including 3rd level. Despite being born and spending all their lives in Ireland they too are asked to pay international fees and they cannot access grants. Explanation: Some media publications and radio programmes have been very supportive of diversity. Television tends to support diversity. There are migrant led publications and migrant led radio programmes that also play a role in supporting responsible reporting. Nevertheless, print media continues to be a place where negative stereotyping and labelling is allowed to develop and perpetuate. At times it is seen as inciting hatred and complaints are common. Talk shows on radio also give voice to abusive, inaccurate and prejudiced attitudes from the public. It is very easy for a news story to be portrayed in a way that will be picked up on by a prejudiced public in a negative way. There is a need to be mindful of how such reporting can have a negative effect on people who aren’t in any way connected to a story but who share and ethnic identity (or who are just from a minority ethnic background). Explanation: The young people said that it was very important to them that diversity is seen as a positive thing and not something that asks for people’s ‘tolerance’. They expressed their hopes and dreams and wanted very much to ‘make a difference’. There are a number of articles that demonstrate that diversity is good for business. Doctors, and especially geneticists, say that diversity is good for the long term health of the nation. The youth and community sector need to show that diversity is good for communities too. Explanation: The young people at the conference explained that it is really important to target and support those young people who are even harder to reach, and who are at greater risk due to their struggle with education and/or employment. The reasons why migrants may end up out of education or employment are many. The young person may have missed out in early education in their country of origin which will leave them struggling with literacy issues. Some may have suffered trauma which can prevent affective learning due to persistent worries or thoughts. Some will struggle due to English language difficulties. The fact of moving (or dispersal) can be very disruptive on education – the same courses may not be available, new friends have to be made etc. Those in the asylum process are not allowed to enter employment. Other minority groups may have left school due to bullying, including homo-phobic bullying. Young people out of education or employment cannot be reached as easily as those who come together to a central venue to attend schools, colleges, etc. Explanation: People listen to leaders, and role models are important. There has been a tendency in Irish politics for politicians to play to public sentiments. For this reason politicians and leaders are sometimes reluctant to take a strong stance supporting migration and migrant rights for fear of losing votes from those that do not support diversity. A few politicians have made remarks that have been racist in tone or sentiment. Given their position of power these comments serve to perpetuate and even incite negative attitudes by the public. What is publicly said sets out permissions for what can be thought and repeated. This is how negativity increases or prevails. It becomes therefore the responsibility of our leaders to be very aware of their language, their sentiments and their beliefs. It is also important that negativity is balanced by positive statements. For this reason it is important not to just stay silent or neutral but to be an advocate for diversity, equality and for human rights. Just as President Higgins demonstrated during his election campaign. Irish politics is not diverse – representation of women is very low, and ethnic diversity is rare. This needs to change from the bottom up, from membership in political parties, representation in local politics up to national politics. Explanation: Youth friendly language is important to young people. It plays a part in identity and belonging. It can set generations apart – with only those who understand or ‘who get it’, being allowed to cross the divide. It could also set groups of young people apart from others. Therefore it should be respected but not allowed to divide people. More crucial is the need to use plain English – this will help those whose first language isn’t English as well as those that may have learning difficulties. It also makes it easier and clearer for everyone. It doesn’t mean dumming down English and the wealth the language offers. It means saying things in a more straightforward way. Explanation:The Irish Government has been developing a new immigration bill since 2005. The need for new legislation is recognised by all. A number of NGO’s have made submissions over the years. With changes in Government it has never been passed and it is now on its 3rd version. There is no date for when it is due to come before the Dáil again. There are 2 key issues that the legislation will address – the asylum process and visa regulations. The EU is working toward a joint process for determining refugee applications. This will mean a reduction from the current 3 phase process in Ireland to a 2 stage process. Currently Ireland is the least likely EU country to grant refugee status with only 1% of applications being granted status per annum. This leaves a significant number of asylum seekers in a drawn out process of up to 7 years, living mostly in direct provision centres, with the fear of deportation hanging over them. These centres have been heavily criticised by NGO’s, especially for the affect they have on young people residing in them. More clarity is needed regarding visa regulations. In some instances, simplification is necessary such as similar rulings across different visa types. Migrants need to have clear rules and guidelines that they can work within. The visa regulations need to take account of Ireland’s changing employment patterns together with the rights of migrants who should be entitled to enjoy family life, to set up homes and plan for the future. Advocate for changes to the direct provision system to make it more humane. Do what you can to support people affected by immigration legislation in your community. Involve them in youth work to connect them to the community. Explanation: In recent years English language support has been heavily cut in schools. Schools and teachers have expressed deep concern that this will result in young migrants failing to achieve their potential. A significant number of young migrants and their parents do not have good English language skills. This leaves them at a huge disadvantage and at risk of isolation and marginalisation. Explanation:The Equality Authority has stated that challenging stereotyping is crucial to tackling inequalities. The inherent dignity of each individual can be damaged by stereotyping. This in turn can limit individual development and reduce people’s options in life. It especially affects people included in the 9 grounds. This is because stereotyping reduces a person or group to a prescribed and limited description. It doesn’t allow for alternative or broader descriptions. It often stresses negative traits or it turns certain traits into negative interpretations. For example, stereotypical views of women have led directly to less women being in managerial or political positions; stereotypical views of Travellers has led to difficulties in getting employment, given access to public spaces etc. Explanation: When people from diverse cultures spend time together there can be clashes due to differing ways of behaving. We all unconsciously absorb a way of looking at the world. The culture we grow up in determines our beliefs, values, and the practices and traditions we are familiar with. We tend to think of our ways as the ‘right’ ways. Even if we change our beliefs over time we will still be connected to certain ways of thinking. From our cultural perspective we can sometimes view other people’s behaviour as rude or ‘wrong’ or just strange. Sometimes, over time, another person’s behaviour can start to annoy us or its unfamiliarity makes us less easy in ourselves and therefore less tolerant. Stress can make this worse. Whenever we get annoyed, upset or dismayed by the behaviour of someone because of their different cultural norms a cultural clash has taken place. We may not even know that the clash is based on cultural differences. We usually don’t know how we are culturally conditioned as it comes so naturally to us. One of the ways to tackle this is to try to understand why people do what they do – to put yourself in their shoes, to imagine their life story. Dialogue is important to develop understanding. When the clashes can’t easily be resolved it can help to find what values you have in common. People may act in very different ways but they may be doing so because they both put a similarly high value on something, for example, on education for their children, or the importance of marriage, or respect for women. All of these values can result in very different approaches but when it is realised what values are shared it makes it easier to discuss the approaches taken in a more open and honest way. Explanation: Religious faith (or none) is deeply connected to a person’s identity. It cannot be separated from a person’s sense of themselves and their place in the world. However, many people from minority belief systems or religion feel that they are excluded because Ireland’s social structures lean so much toward the Catholic majority. Schools and youth clubs are often seen as spaces where religious diversity (including no religion) is not valued as much as it could be. There are many situations when people feel that their religious background or belief system is being attacked or negatively portrayed. Often this is based on negative and/or false assumptions. Muslims often experience this negativity in particular. Islamophobia is a fear of, or negative attitude toward, the Islamic faith and its followers. Three young people from Ireland will attend the EU Youth Conference in Cyprus to represent the views of the young people who attended the consultation day on the 28th June. Pictures from the consultation are included below. 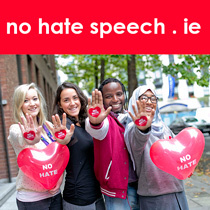 Tell us what you think about inclusion in Ireland. Continue the conversation at your youth group and among your friends and post your thoughts on our Comment Page. This consultation “We’re Here, Hear Us Now” was part of a Europe Wide Consultation with Young People on issues that affect them. The recommendations that young people and youth leaders made at this consultation will join the recommendations from consultations in all the European member states and set the agenda for a EU Youth Conference in Cyprus in September, which will be attended by policy makers and young people from all over Europe. This process is ongoing and is called the Structured Dialogue process – it is a way that European policy makers consult with young people and youth work organisations. For more details on this process see video below.